Fully self-contained apartment on its own floor ensures maximum privacy. Allessandro Maandini's Ryokan revolves around a fabulous building tucked away adjacent to the top of the Old Belair Rd. at Blackwood, just fifteen minutes up Fullarton Rd from the city. The building was the brainchild of Adelaide architect Peter Villis. He was inspired by Japanese Architect Professor Koshio Kawashima whilst studying under him at the Japanese Institute of Architects in Tokyo. This building whilst modernist in concept draws on Zen philosophy of creating an environment to live in that is at peace with its environment. To that end Villis designed a five level building of highest structural integrity using steel and specially transported Bendigo White Clay Brick and external walls of glass, that sheet light into spaces that cantilever towards an inner atrium with a central Japanese stone garden. Since 1998 this exquisitely decorated Japanese interior has played host to many visitors from all over the world that have come to enjoy the ambience of silver service quality Japanese food presented fireside in the guests own private dining room overlooking a backlit Japanese garden. Host, Allessandro Maandini, offers a venue unparalleled in the Southern Hemisphere. The concept of visiting a Ryokan dates back to before the 17th century when Daimyo (or Warlords) were summoned to the old capital of Edo to present themselves to the Emperor. Along the roads leading to that city, Ryokan developed to offer accommodation, food and an "Education" to the Daimyo to ensure his favour with the court. Ryokan has connections to Geisha and these buildings remain and still flourish in Japan. To go to a Ryokan in Japan is regarded as one of the highest cultural activities along with Kibuki theatre and the like. Fortunately there is now such an experience with an Australian twist only minutes up Fullarton Rd. The accommodation area features a self contained Apartment with a delightfully dramatic ensuite Japanese bathroom equipped with a steam bath and spa for instant relaxation at any time during your stay. A small kitchen and bar compliment an adjacent private courtyard. A high fidelity Bang and Olufsen music system ensures the possibility of your favourite music. The spacious interior is applauded by Japanese visitors as "not so squeezy! ", and they love the queen size bed as the alternative to sleeping on the floor. Allessandro Maandini's Ryokan is a first for Australia and Adelaide and has already been the feature of National Television programs such as "Getaway","Healthy,Wealthy and Wise", and "Postcards". It has also been featured in Harpers Bazaar, Cleo, The Gourmet Traveler and newspapers Australia wide. It appears to be a favourite for folk looking for avenue for a quality time together; a wedding night, a surprise celebration or anniversary or a small group of friends to have a dinner party. Gift vouchers are available, valid for 6 months from date of purchase. Since opening in 1998 Allessandro Maandini's Ryokan has been featured extensively on a range of National TV programmes such as "Getaway", "Healthy, Wealthy, and Wise", and "Postcards". It was awarded a FIVE STAR RATING in MARCH 1998 and has been a feature in CLEO Magazine, The Advertiser, and The Melbourne Age, along with Quantas Inflight Magazine and a whole host of Tourist Publications. Normally the ryokan is equipped with a regular queen size bed situated low to the floor in the japanese style . We do have a Futon style as well . 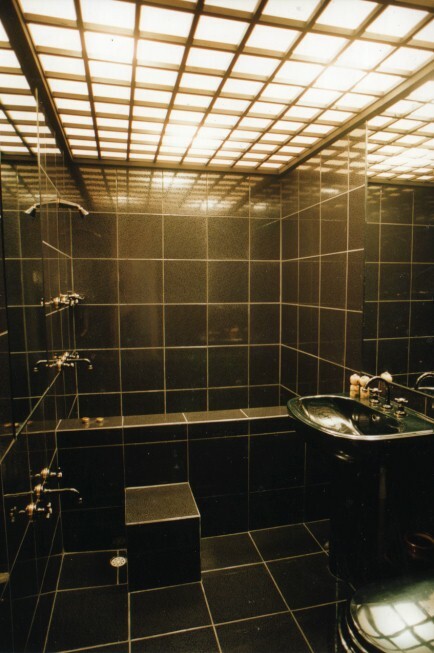 Bathroom: 2 Ensuites plus traditional Japanese steam bath. 1 ensuite sauna. Tariff: B&B $200 p/person p/night, inc. GST. Dinner: By prior arrangement - 4 course, finest quality Japanese style meal,(Sukiyaki main course) $100 p/person, inc. GST. Nearest Town: Blackwood. Adelaide City only 15 minutes away. Bookings are confirmed by way of deposit . ( non refundable ) Bookings cannot be accepted under any circumstances without said confirmation .Please note that these premises reserve the right of refusal and can terminate reservations without notice in certain circumstances. In the event of a client not notifying of a cancellation within fourteen days prior to to a booking this venue will debit against said client the balance of said booking.